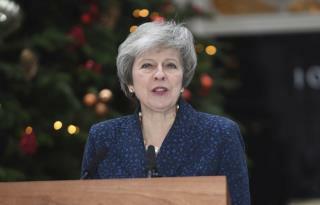 (Newser) – When Prime Minister Theresa May entered a room in the House of Commons to speak to Conservative lawmakers ahead of a no-confidence vote Wednesday, she was greeted by table banging—a customary sign of approval, reports the AP. It ended up being a prescient gesture: The BBC reports she needed the votes of 159 MPs to remain the Conservative leader, and she crossed that threshold, winning the confidence vote 200 votes to 117, reports the Guardian. It adds that after the words "does have confidence in..." were announced, it could not hear the rest due to the eruption of cheers. Brexit was another issue the Russian Social Media Special Forces played in to disrupt Democracies around the World. And Golly Gee it worked! Wow. I have no personal feeling either way, but I thought she was dunfer.